The H.B.S.C. and M.B.S.C. 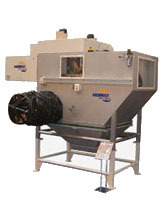 range of automatic low profile sack slitting machines have been designed to handle a wide range of differing bag sizes of powder or granular materials in a fully enclosed environment. The twin rotary knife cutting action ensures maximum powder recovery while the emptying bag is automatically ejected and compacted into a plastic waste receiving bag. Opening rate up to 600 bags per hour depending on bag size and free flowing characteristics of the contents. The machines are of a compact design incorporating automatic infeed conveyor, bag emptying unit, dust extraction unit and waste bag compactor. The fully automatic nature of the Bel-Tyne bag emptying machines make them an ideal choice for today's environment- user friendly. Versatility - Can handle a wide range of differing bag sizes containing granules and powder materials. Automatic self adjusting cutting action for various bag sizes. Safe and Clean - Works automatically in a fully- enclosed system, reducing atmospheric pollution. Clean cutting action minimizes product contamination. Durable - Quality construction and long self sharpening blade life. Easy to Operate - Effortless, trouble- free processing. The operator loads the bags onto an integral powered horizontal infeed conveyor, which feeds the bags onto a retractable spike conveyor. This retains the bag during the cutting cycle. Two rotary knife- cutting units automatically adjust to differing bag sizes and ensure the bag is cut cleanly on three sides, efficiently discharging the contents. As the bottom half of the bag is drawn around and under the spiked conveyor and an air facility is available to ensure maximum material recovery as it passes through the cutting stage. During the bag transfer, the spikes retract and the empty bag is automatically ejected into the waste compactor, which compacts the bag into a plastic waste- receiving bag. The Bel-Tyne SAM 200 automatic bag slitter caters for the low volume throughput market. The unit handles all types of bags at a maximum rate of 200 bags/ hour. The operator opens access door and pushes the bag from the loading plate directly onto the internal bag support table. The door is then closed and the operator presses the start pushbutton which engages the door lock for safety interlock. 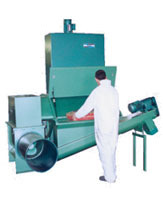 From then onwards the bag is automatically cut open, the product discharged out of the machine and the empty waste bag is automatically transferred to the integral compactor unit which compacts the bag into a receiving tube. Upon completion the door latch disengages and allows the loading of the next bag. The Bel-Tyne Manual Sack Opening Units allows the manual opening and disposal of bagged material under dust controlled conditions, with the added feature of an integral automatic waste bag compaction. The units can be attached to many types of ancillary equipment, e.g. screws, disk lifts etc. The operator opens the fully hinged, front opening door and places the bag onto the bag support grid. The bag on the support grid is cut manually by the operator and the contents of the bag discharged down a feed chute beneath the bag support grid. When empty, the waste bag still inside the unit, is discharged by the operator to the rear, where it is automatically compacted into a waste receiving plastic bag. 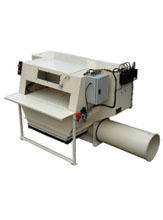 An integral dust extraction unit can be fitted from which pulsed materials are fed back into the system. The Bel-Tyne Big Bag Discharging Units will handle many variations of flexible big bags, including single trip with and without inner liners. The dischargers can be loaded from fork lift trucks or by overhead hoist assemblies, which will come as a complete system. 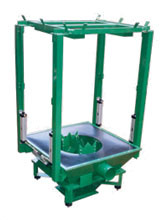 Bel-Tyne offers a versatile bulk bag discharge unit suitable for both multi- trip or single trip bulk bags. The flexible mounted discharge cone can be pneumatically or electrically vibrated (depending upon site requirements), to assist discharge for non free flowing materials. As standard, discharging units incorporate a single post suspension frame with adjustable bag support. Standard unit has a maximum capacity of 2000Kg.